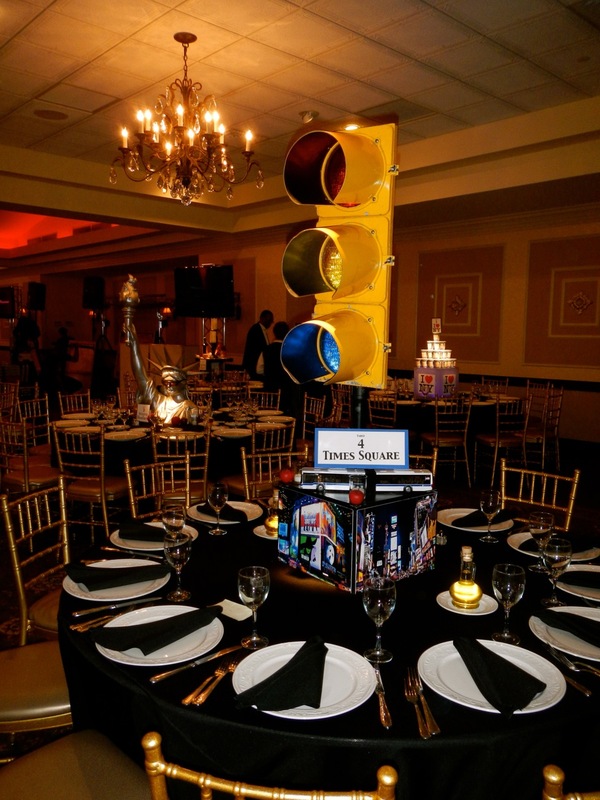 A Times Square themed centerpiece with Times Square images and an authentic, illuminated traffic light. 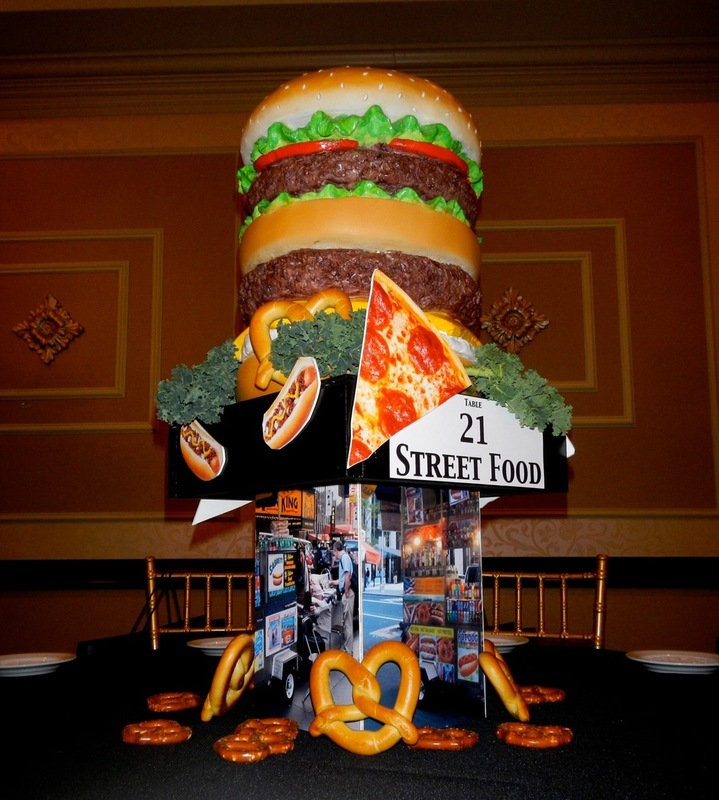 For our first bar mitzvah of 2013, we were asked to create centerpieces based on New York City's cultural landmarks. The mitzvah honoree is very involved in the arts, so we emphasized art culture throughout the decor. We featured iconic films such as King Kong, famous places such as The High Line and Broadway, and classic events such as Tribeca Film Festival. Every centerpiece was completely unique in style and composition. The eclectic mix created a sense of an art gallery displayed throughout the 22 tables. 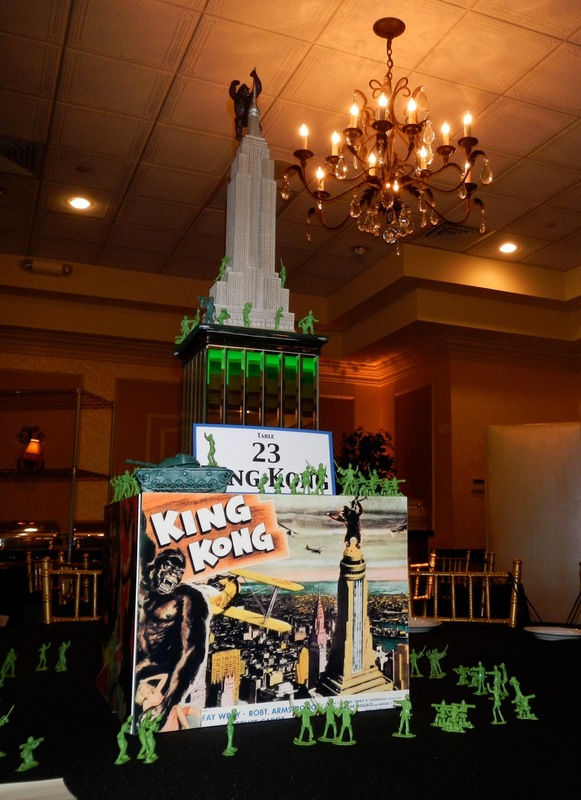 A King Kong centerpiece includes an Empire State Building statue, mirror cube, King Kong images, and an army of toy soldiers. Our Statue of Liberty bust statue is always a hit. A gorgeous carousel horse statue represented the iconic Central Park Carousel. Our client wanted street food to be represented in one of the tables. We used our giant hamburger, along with images of street food carts and fresh food accents. These famous coffee cups are all but extinct now in NYC, but we found them and built a tower of them. We also illuminated one of our cube foundations with blue LEDs and added images. For our Little Italy centerpiece, we featured carved wood candle holders, an assortment of preserved and prop foods, fresh pasta, and images of Little Italy. We even included Egil's favorite: lots of fresh garlic. Contact us to see more of our one of a kind centerpiece designs.